A finely detailed globe crafted in flawless optical crystal mounted on a bevelled base. These 3.5in diameter globes are made in blue glass. The clear glass base includes a metal engraving plate and these awards can be engraved either on the plate or directly onto the crystal base (by default we engrave onto the plate, please contact us if you require engraving direct on the glass). Engraving is supplied Low-cost of charge for your entire inscription. 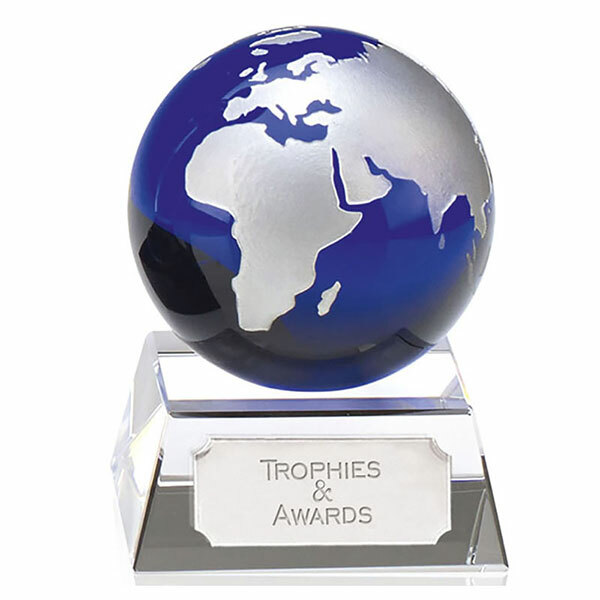 These attractive globes are ideal as personalised gifts or as achievement awards, and are supplied gift boxed.